What a difference a year makes. On April 18th, 2010, Jason Marquis didn’t get a single batter out before he was sent to the showers having surrendered 7 runs in the first inning. On April 17th, 2011, Marquis wasn’t invincible, but he certainly was good against the streaking Brewers. Marquis went 7+ and threw 100 pitches in his win today, and continued the Nats streak of starters going more than 5 innings, which they’ve done in every game so far this season. The bats awoke in the fifth and sixth innings for the Nationals, and that was enough to bring the team back to .500 for the season in an 8-4 victory. Also racking up solid performances in the front half of a single-admission doubleheader at Nats Park were Mike Morse (1-3, R, RBI) and Ian Desmond (2-4, 2B, HR) who have both been struggling with offensive production during the early weeks of the season. The move away from the top of the lineup appears to have relaxed Desmond, and working with a lead appears to have relaxed Morse. The big power came today from two three-run bombs from Danny Espinosa and Pudge Rodriguez in the 5th and 6th innings, and Desmond would add a solo shot to left in the 8th. As Ben Goessling tweeted this afternoon, “This game feels like an exorcism for the Nationals’ offense,” and he couldn’t have been more right. Every member of the Nats’ starting 9 picked up a hit today, including Jason Marquis. The team’s slugging percentage went up by 30 points in their offensive explosion, but they’re certainly not out of the woods just yet. The Nationals also showed a bit of a weakness this afternoon from their bullpen. After Marquis’ strong 7+, 2ER, 4K performance, the bullpen gave up 4 hits, 2 runs and walked a pair across three pitchers. Slaten and Gaudin both had very shaky outings, and Clippard’s was nearly an adventure especially after a dropped infield fly rule ball by Espinosa. It wasn’t enough to put the game in jeopardy, but it certainly was cause for concern about the strength of the reliever corps. 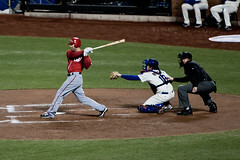 The Nats returned to .500 ball for the first time since April 2nd with their win Sunday afternoon.